, an eminent lawyer and philosopher, called Pacius de Beriga, from the name of a country seat belonging to his father’s family, near Vicenza, was born at the latter city in 1550. His parents bestowed every pains on his education, and he is said to have made such progress in his first studies as to have composed a treatise on arithmetic at the age of thirteen. 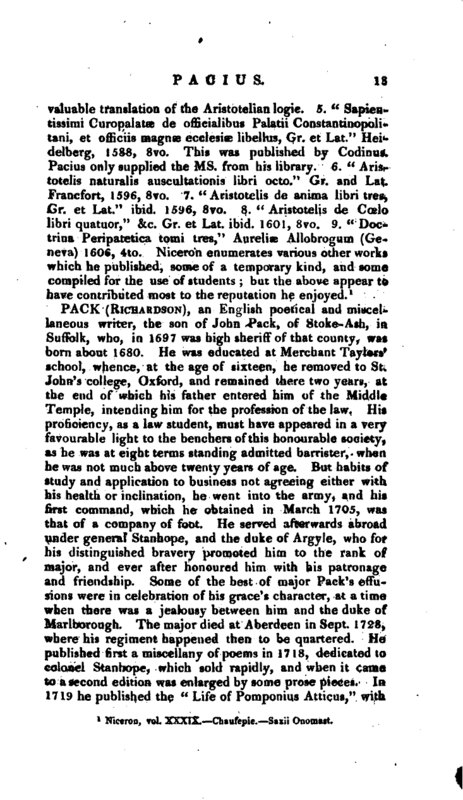 For farther proficiency he was sent to Padua, with his brother Fabius, who afterwards became a physician of eminence, and is mentioned with great honour by the medical biographers. 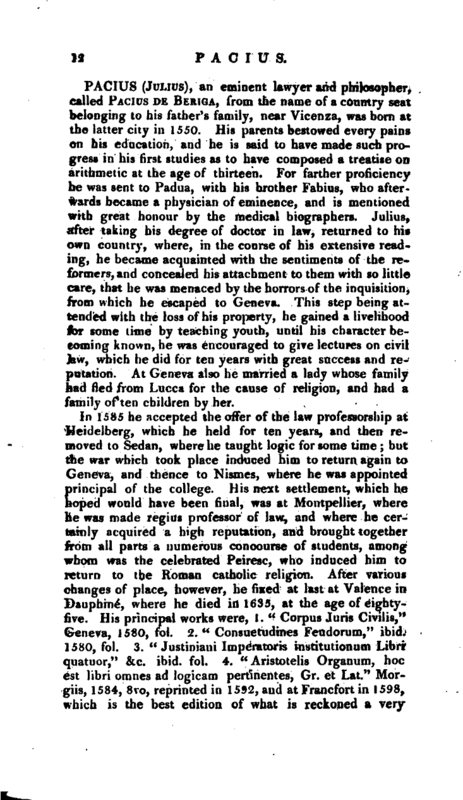 Julius, after taking his degree of doctor in law, returned to his own country, where, in the course of his extensive reading, he became acquainted with the sentiments of the reformers, and concealed his attachment to them with so little care, that he was menaced by the horrors of the inquisition, from which he escaped to Geneva. This step being attended with the Joss of his property, he gained a livelihood for some lime by teaching youth, until his character becoming known, he was encouraged to give lectures on civil Jaw, which he did for ten years with great success and reputation. At Geneva also he married a lady whose family had fled from Lncca for the cause of religion, and had a family of ten children by her. Niceron, vol. XXXIX. —Chaufepie,—Saxii Onomast.